Migrants and Syrian refugees have become the new 'stranded polar bear' of climate change imagery. But most such impacts will seldom be so dramatic or camera-ready. Syrian refugees, 2014 (Photo Credit: Office of the United Nations High Commissioner for Refugees, UNHCR). The aperture for seeing the phenomenon of climate change has widened. It comes at a time when the world is seeing a record numbers of displaced persons estimated at 60 million worldwide, a grim trend that U.N. officials have long warned could be driven by climate change. This awareness and attention are positive in many respects, but there is also a danger, observers say, that oversimplification may end up pointing the public in the wrong direction. Most affected persons will experience a slow but powerful erosion of livelihood – from environmental changes that include drought, extreme weather, and flooding, among many other climate change-driven phenomena – and not a sudden, dramatic need to flee. Erroneous in law … and politically misleading? Among those who study climate change communications, there has long been a debate about the uses (and abuses) of apocalypse narratives and images of impending climatic catastrophe, and whether or not such dramatization and “doom and gloom” ends up motivating action or simply paralyzing the public. The conventional argument against such language has been that it is speculative media hype; it is imprecise in the context of the quantitative research, which suggests mostly incremental change and only probability-based correlations. But those who would urge caution in framing and language now face a stiff challenge given events such as the conflict in Syria, where the issue is no longer academic and speculative: Disruptive conflict is happening before the world’s eyes, and research has linked it strongly to climate change. The historic drought that fueled mass migration to Syria’s cities beginning in the mid-2000s undoubtedly helped grease the skids for the civil war. 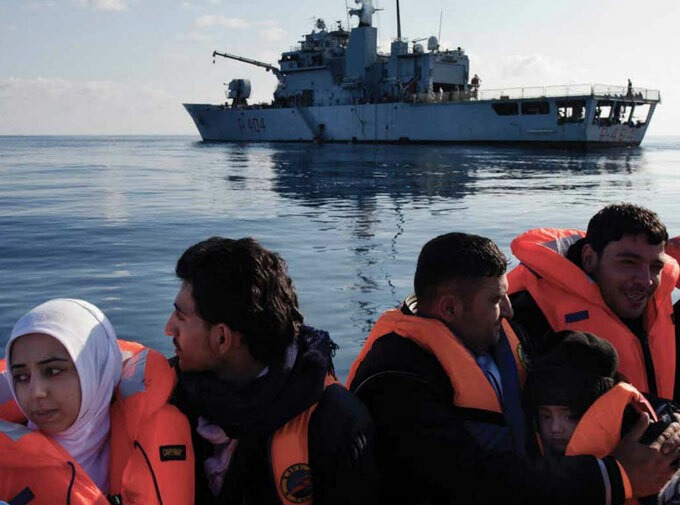 Still, some experts in this area of climate change, security, and migration emphasize that most of the effect is likely to be far more subtle – and even that the image of the “climate refugee” could mislead. Climate change may have a substantial negative impact on the lives of many, they say, but it will not always necessarily come in the form of a family fleeing war in the dead of night, or of a group piling into a boat at the last minute as water subsumes their island home. Of course, resource pressures are acknowledged to have played a role in a wide variety of conflicts and tragic events: From the French Revolution to World War II and the Holocaust, from Rwanda to South Sudan. Under international law established by the landmark 1951 Geneva Convention and 1967 Protocol Relating to the Status of Refugees, “refugee” has a very precise definition and set of criteria, and it centers on border-crossing driven by a “well-founded fear of being persecuted for reasons of race, religion, nationality, membership of a particular social group or political opinion,” according to the United Nations. However, in October delegates from more than 100 nations came together to begin laying the policy groundwork, known as the Nansen Initiative, to ensure the legal “protection of cross-border displaced persons in the context of disasters and climate change.” For years now, scholars and policymakers have debated whether to extend the 1951 Convention to cover refugees of this nature or to establish an altogether different global legal architecture to help them. Kurdish Syrian refugees, 2014 (Photo credit: UNHCR). Moreover, that report notes, “Environmental change is equally likely to make migration less possible as more probable,” as travel is expensive and negative changes may deplete the capital of those affected. On that point, other research has suggested that increases in temperature and precipitation may produce opposite and conflicting effects. 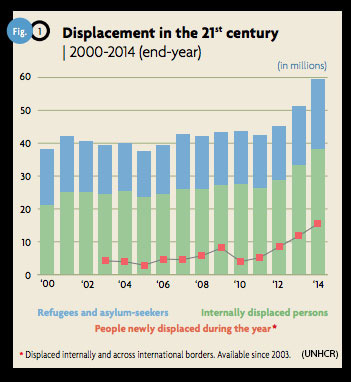 Most people who are forcibly displaced are displaced by armed conflict, and most of them do not cross borders. The relationship between climate change and war is highly uncertain. We cannot conclude that this key driver of forced migration will change under climate change (indeed the post-1989 trend is towards less armed conflict) …. The humanitarian problem is not because of people who may move, it is because of the people who cannot. People who can move have some capital – it may be a forced move in some sense, but the fact of movement signals capacity. The people who cannot move are the ones who are unable to exercise any other option: the ones left behind in deteriorating environmental conditions and poverty traps. We lose sight of this when we focus on refugees. This uncertainty over the climate-conflict connection remains an area of active research. A 2013 meta-analysis published in the journal Science synthesized findings from 60 prior studies to look more deeply at this issue. The researchers, Solomon M. Hsiang of Princeton and Marshall Burke and Edward Miguel of UC-Berkeley, concluded that in the post-1950 era the “magnitude of climate’s influence on modern conflict is both substantial and highly statistically significant.” A 2014 study in the Proceedings of the National Academy of Sciences that focused on that same issue in the context of recent decades in sub-Saharan Africa also found significant correlations; but it concluded there are inconsistencies in the data, and the relationships are more “nuanced” than researchers have previously identified. In any case, among researchers who study human migration patterns, it is well established that the most vulnerable in situations of emergency movement are frequently those who cannot move. (Hurricane Katrina, where those who died or were injured were likely to be poor and without means to leave, illustrated this dynamic for many Americans.) Further, migration experts point out that there is often a complex mix of both “pushes” – events that force migration – and “pulls” – such as economic opportunity or family abroad – that explain movements. Single adjectives (e.g., “climate”) attached to “refugee” or “migrant” would therefore be reductionist and mostly unhelpful. None of this diminishes the very real effects of climate change in terms of making extreme weather, drought, flooding, and other disruptive patterns much more frequent and likely. And those inevitably will lead to disruptive human impacts. Given this nuance, what precisely can we say, then, about migration and climate change? What should the public know? Adil Najam, dean of the Pardee School for Global Studies at Boston University, says that climate change-influenced migration will not typically look like “disaster migration.” Instead, changes at the micro level will mean vulnerable persons will lose their livelihood very slowly but steadily, producing something that looks more like classic economic migration. For example, in the Sundarbans delta in Bangladesh, Najam says, this situation is already happening, with fisheries resources being depleted. Rural villages begin hollowing out. And those Bangladeshi fishermen will eventually, Najam notes, end up as “your cab driver” in some city. They will be part of the vast but incremental movement of persons from rural places to slum-ringed megacities that is already defining the twenty-first century (the United Nations projects that the global urban population will increase by an eye-popping 2.5 billion persons between 2014 and 2050.) These fast-growing urban areas themselves are highly susceptible to conflict, but climate change will not be the obvious cause. “There is no one taking a photograph,” says Najam, a native of Pakistan. “There is no photograph to be taken.” It’s a “harrowing” and “insidious” phenomenon, because it happens to the “weakest and most vulnerable” but unfolds so slowly that no signal moment ever makes news or creates a media “visual” for the outside world. What seems reasonably certain in the coming decades is that an already explosive trend in migration from the global South to northern countries will accelerate. 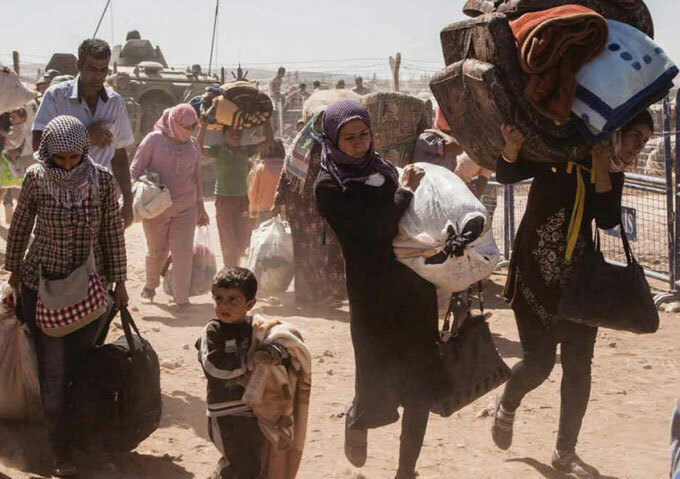 This migration will happen with or without many more “Syrias,” where a proximate cause of refugee crises is plainly climate change. The key policy challenge may involve smoothing the path for those confronting deprivation and livelihood loss, and therefore having to move to a new place. If nothing else, the Syrian refugee crisis shows that the world is ill-prepared for this kind of mass adaptation. “Migration is a very rational strategy, and it has been deployed for millennia to deal with changes in the environment,” Dabelko of Ohio University says. John Wihbey, a regular contributor since 2008, is an assistant professor of journalism at Northeastern University.